Easy, Delicious Kinder Chocolate Rocky Road with Biscuits, Marshmallows and Kinder Bueno.. Heavenly Kinder Bueno Rocky Road! Soooooo Rocky Road is a delightful thing. I adore anything like it. I think I have made this obvious with posting several Rocky Road recipes on here such as my Rolo Rocky Road, and Mint Aero Rocky Road and several others. Honestly, how can you not like Rocky Road? I simple LOVE it. 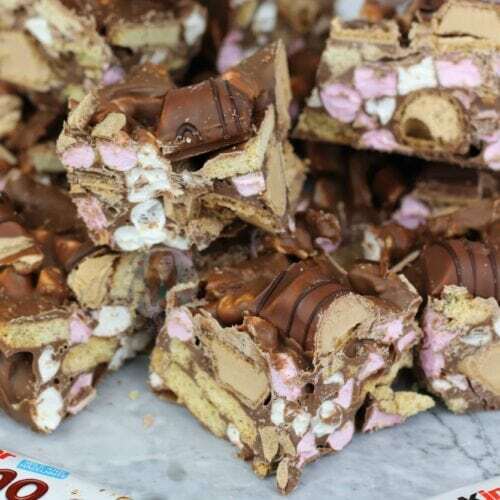 Chocolate, biscuits, marshmallows and more… literally just heaven. They’re a no-bake recipe so they are super easy to make, and you can put pretty much anything you want into them and make them themed. Hence why this recipe was born! As I moved recently I had to pack up my baking ingredients again, and I no joke had several boxes of just chocolates and such. 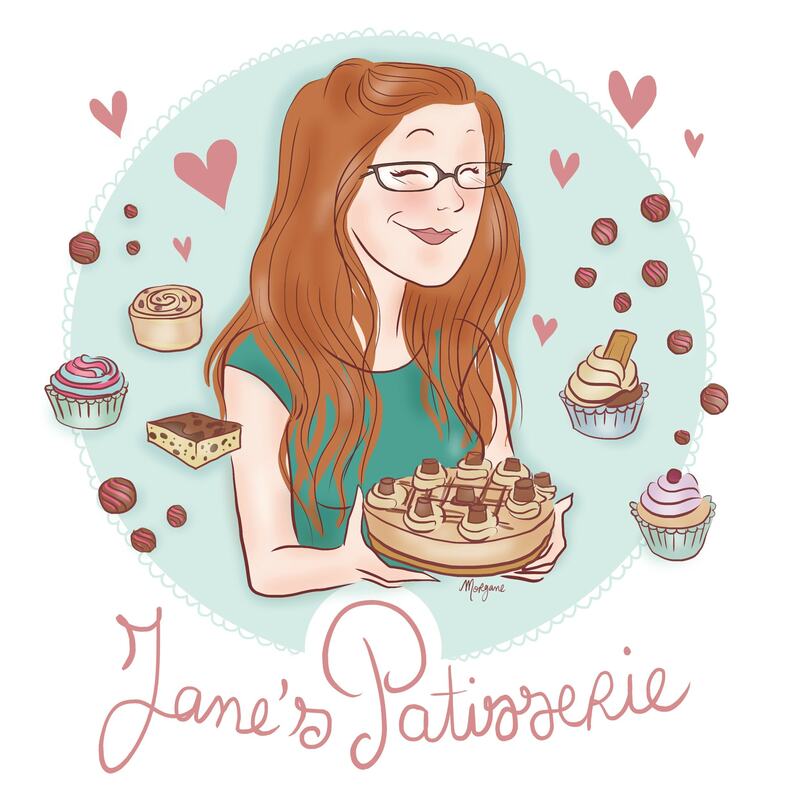 I am a bit of a hoarder when they are on offer, so I just buy stuff… and then work out what I want to bake with it. Not necessarily the way you should do it, but I am slowly working my way through my stash! One of the things that I seemed to have plenty of, was Kinder Bueno and Kinder Chocolate. Honestly, probably enough to start a sweet shop. 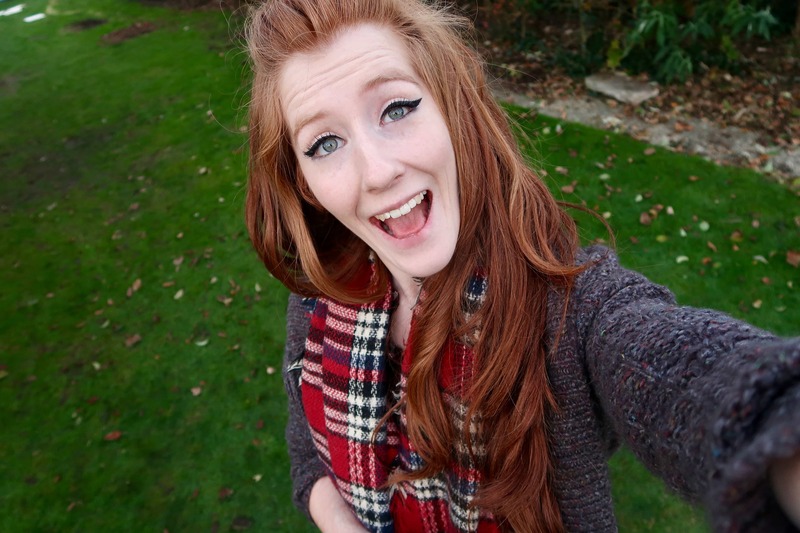 But aaaaanyway.. This one is a little different to most of them. 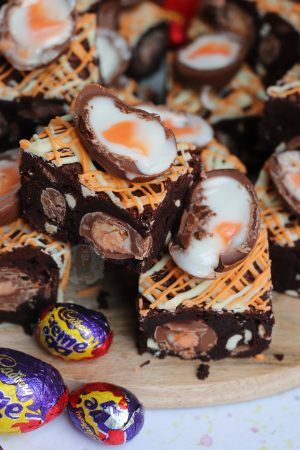 Usually I put some Golden Syrup and Butter into my rocky roads, but this one I wanted to really taste the Kinder flavour, so I decided to leave it out. It makes it a lot harder, and slightly chewier in a way, but still delicious. 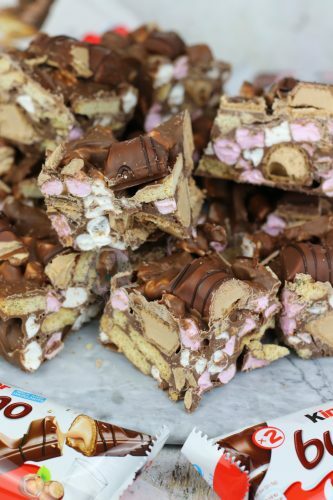 The Digestives and the Mini Marshmallows give it sweetness, and classic rocky road deliciousness, but then the Kinder Bueno themselves are gooooooood. Some people will say “but won’t the Kinder Bueno go soggy” but honestly? It doesn’t matter. Its a different texture to the marshmallows, and the marshmallows, and its also the flavour of the inside. And, the ones on top stay crunchy! My No-Bake Kinder Bueno Cheesecake, and my Kinder Bueno Cupcakes also use the same method of using the Kinder Chocolate for the filling/flavour, and decorating with the actual Kinder Bueno… and as these two are two of my most popular recipes on my blog, I’ll concur that this recipe is gonna be a hit as well. Line a 9" Square Tin with parchment paper and leave to the side. 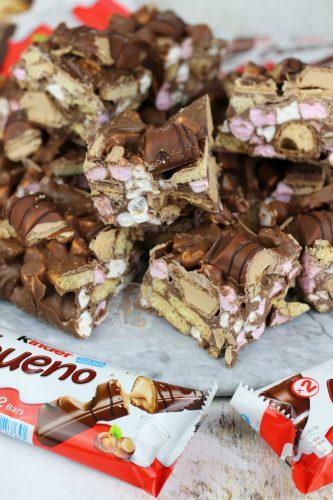 Prep your ingredients - Break your Kinder Chocolate up into small pieces so it can melt more easily, break up the digestives, and make all the Kinder Buenos into individual pieces. In a large glass bowl over a pan of simmering water, add your Kinder Chocolate. Make sure the water doesn't touch the bottom of the bowl, and stir occasionally. 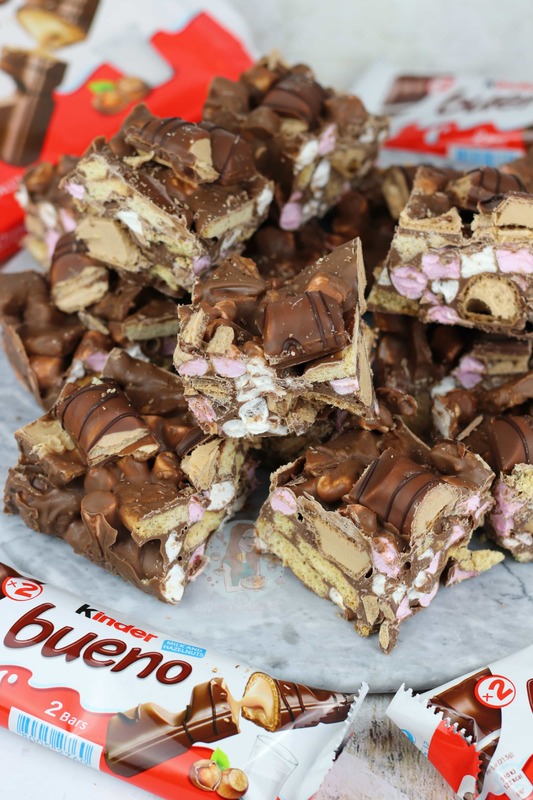 In a separate large bowl, add your mini marshmallows, your digestives/biscuits, and 75% of your Kinder Bueno pieces. Once melted, let the chocolate cool for about a minute, and then pour onto your other ingredients. Mix carefully so its evenly distributed. Pour it all into the tin, and make sure its even. 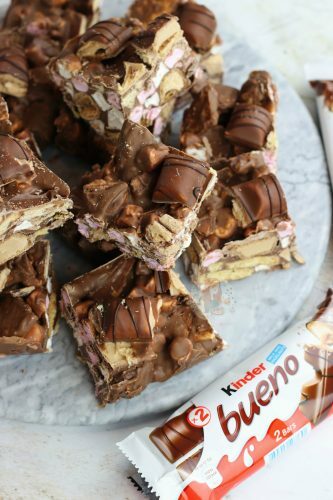 Press on to the top the rest of the Kinder Bueno pieces and let it set in the fridge for 5-6 hours or more. Once set, cut into pieces (I do 16), and enjoy! I used This Kinder Chocolate for reference for the Chocolate base. Its the small bars with the white middles, not Kinder Bueno itself, and not the eggs! 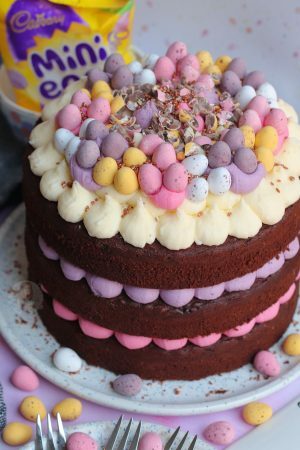 You don't have to use Kinder Chocolate, you can easily use other chocolate, but I really wanted this to be Kinder-full! 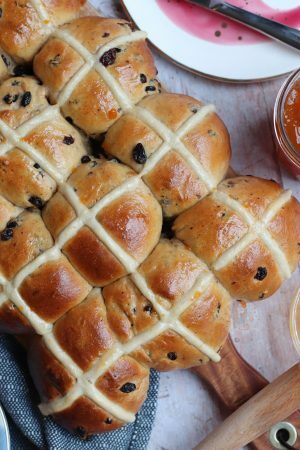 This recipe will last for 1+ weeks, in the fridge. And outside the fridge on a cold day. 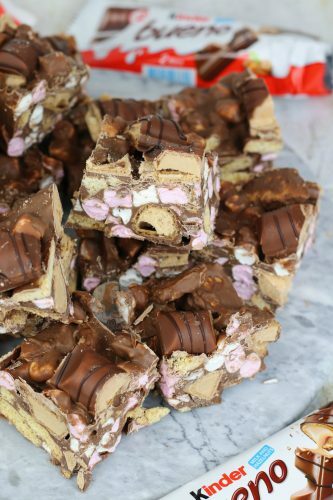 Find my other Rocky Road Recipes on my Recipes Page! Older Next post: Carrot Cake Cheesecake! Newer Previous post: Lemon & Blueberry Cake! 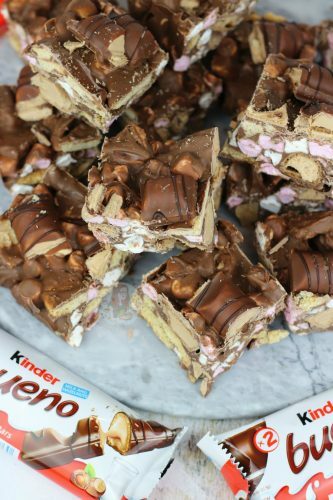 I aboslutely love Kinder Bueno so I’ve bookmarked this recipe. Not sure I’ll ever have any spare to bake with though!